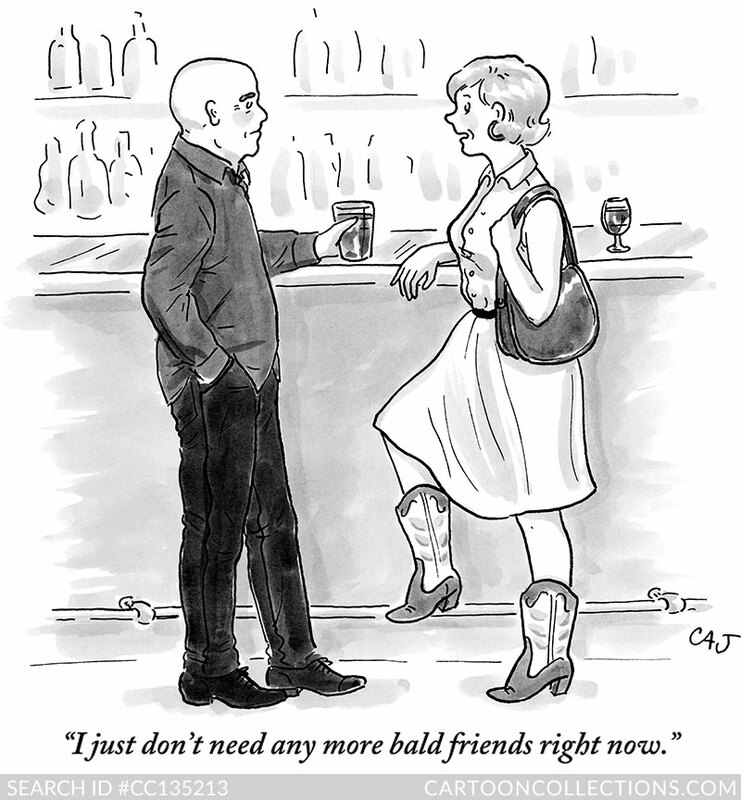 For the past three years, self-appointed cartoon cognoscenti Phil Witte and Rex Hesner have been critiquing New Yorker cartoons each week on their blog CartoonCompanion.com. There, they review each cartoon, discussing its merits, studying its detail and artistry, and ultimately assigning each a 1- to 6-star rating. Self-appointed no longer, we invited Rex and Phil to share their insights and analysis on various cartoon topics and tropes. 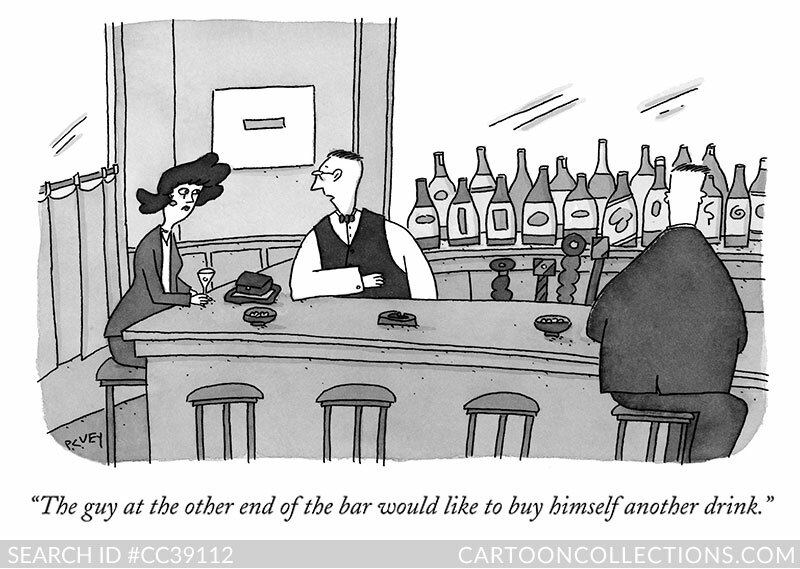 In the first installment of the series, Rex and Phil tackle dating in cartoons set in a bar. Agree? Disagree? Let us know below, and perhaps we’ll add your commentary to the post. Phil: Why do you suppose so many cartoons are set in bars? Rex: Because bars are the perfect place for drunken confessions, failed pick-up efforts, and public humiliations. Rex: This well-dressed woman gets right to the point with an iconic celebrity from yesteryear. Check out the details in Leo Cullum’s beautifully drawn upscale bar scene. Phil: Incongruity drives this cartoon. The woman appears not at all nonplussed by the presence of a realistically drawn ad icon. 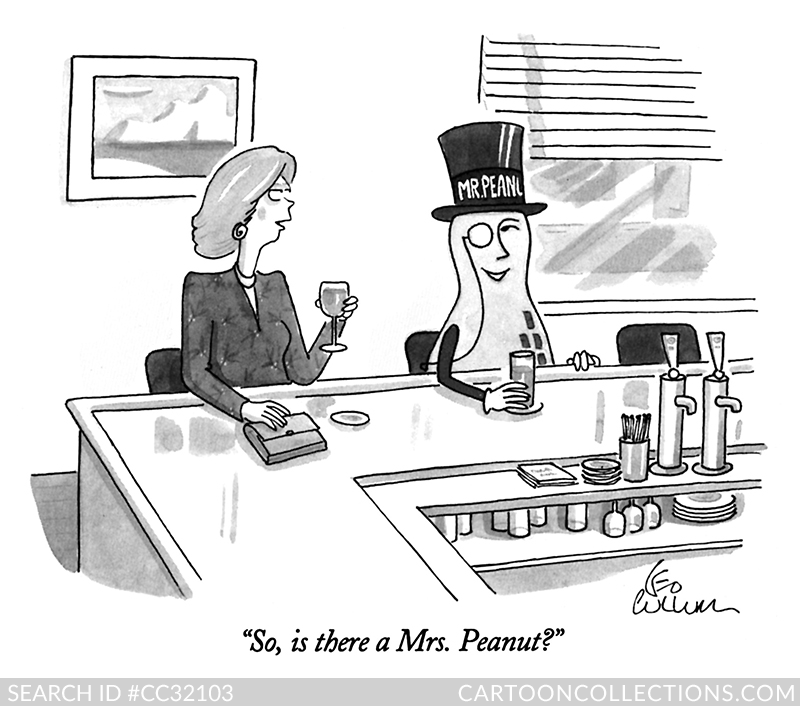 She may not find Mr. Goodbar, but she’s got her eye on Mr. Peanut. 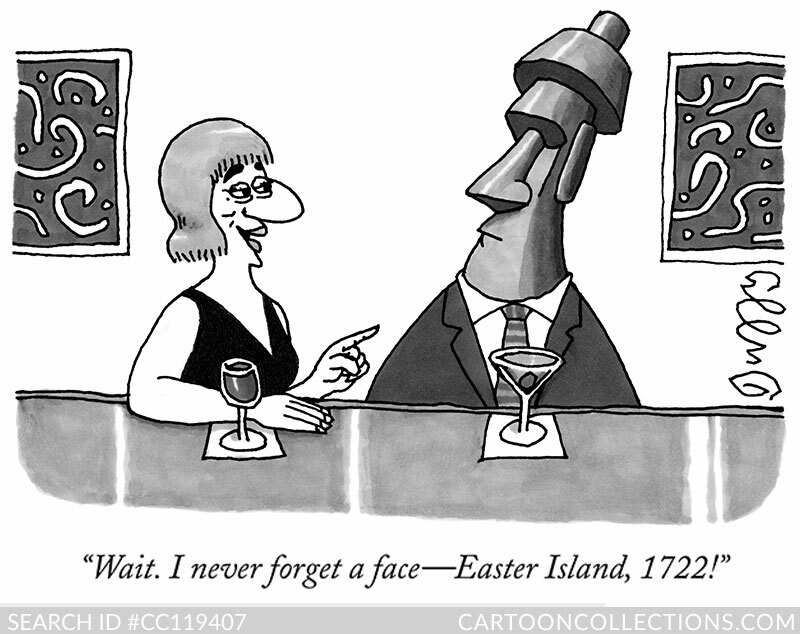 Phil: Speaking of odd-looking guys, here’s a cartoon inspired by the Easter Island heads. 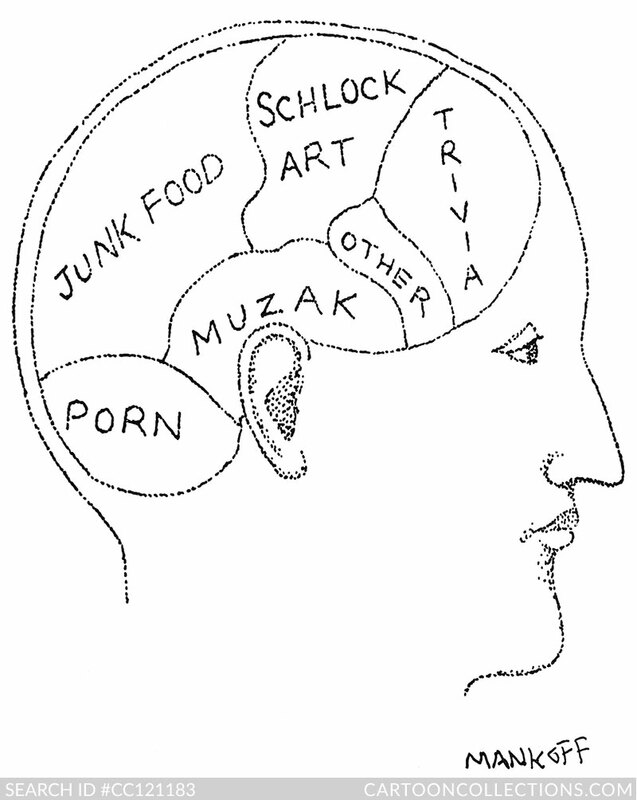 There’s much less detail than Leo Cullum would include, but the head definitely evokes mystery. Again, a seemingly everyday person interacts comfortably with an image from an alternate reality. Rex: Right, and Mr. Stonehead doesn’t seem so out of place with his fitted suit and martini. The cartoon also provides a little history lesson; European arrival to the island occurred on Easter Sunday in – you guessed it – 1722. Phil: Our cartoonists can’t resist getting animals into the act. 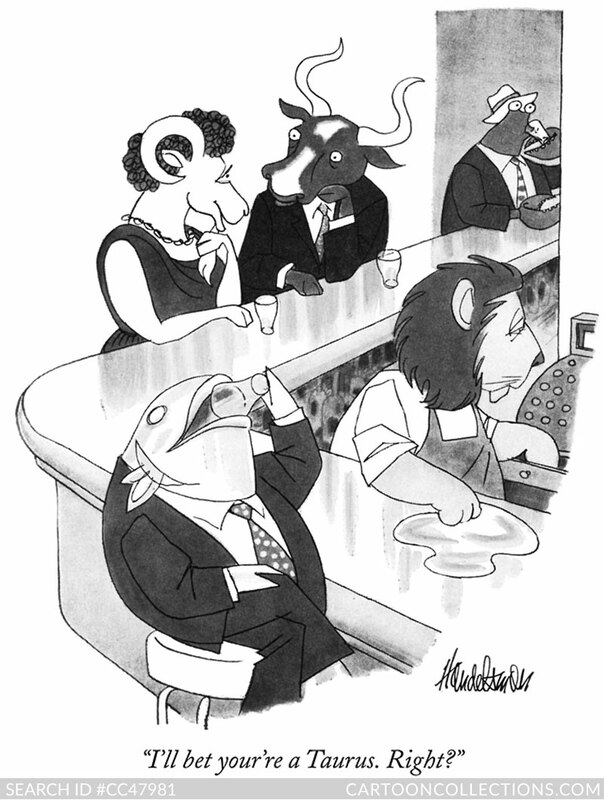 Take J.B. Handelsman’s horoscope-themed cartoon, for example. Unlike the others, no human interacts with the non-human characters. I love how the Capricorn goat tugs flirtatiously at her beard. Rex: That fish in the foreground doesn’t look too out of water; he seems to be keeping hydrated. 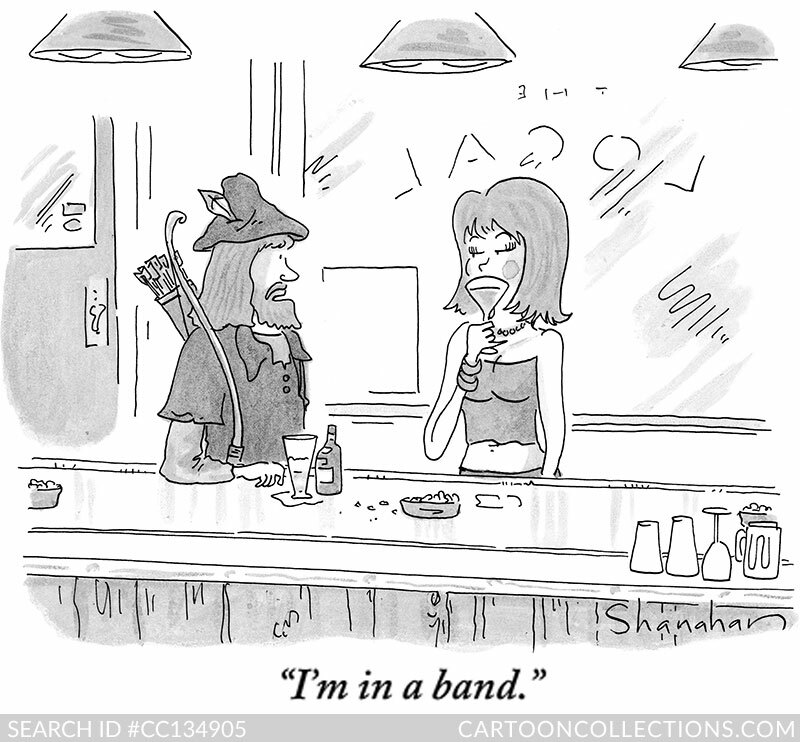 Rex: A simple pick-up line takes on new meaning in this Robin Hood cartoon by Danny Shanahan. The object of his desire does not seem impressed. Phil: Poor Robin—he looks so sincere. 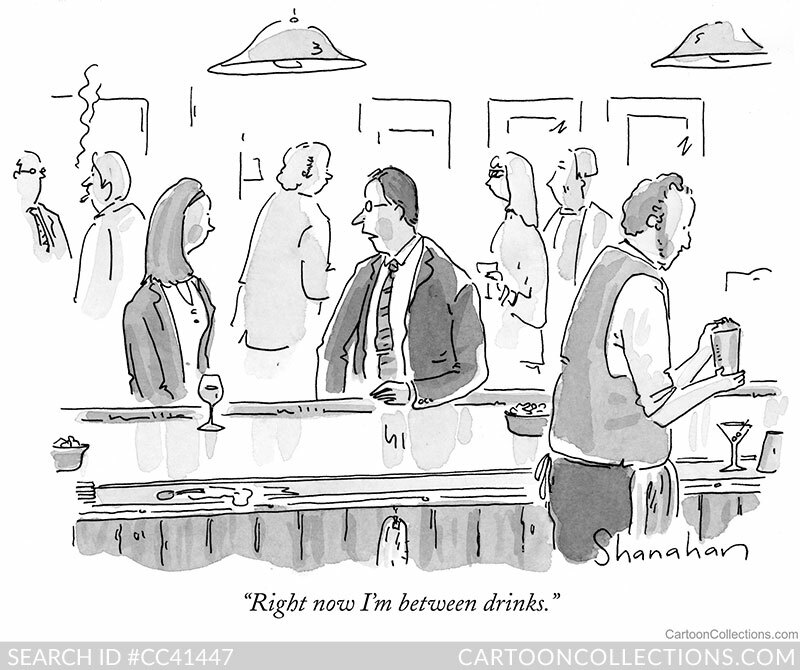 Again, the cartoon turns on placing a person out of time or place into a familiar setting. 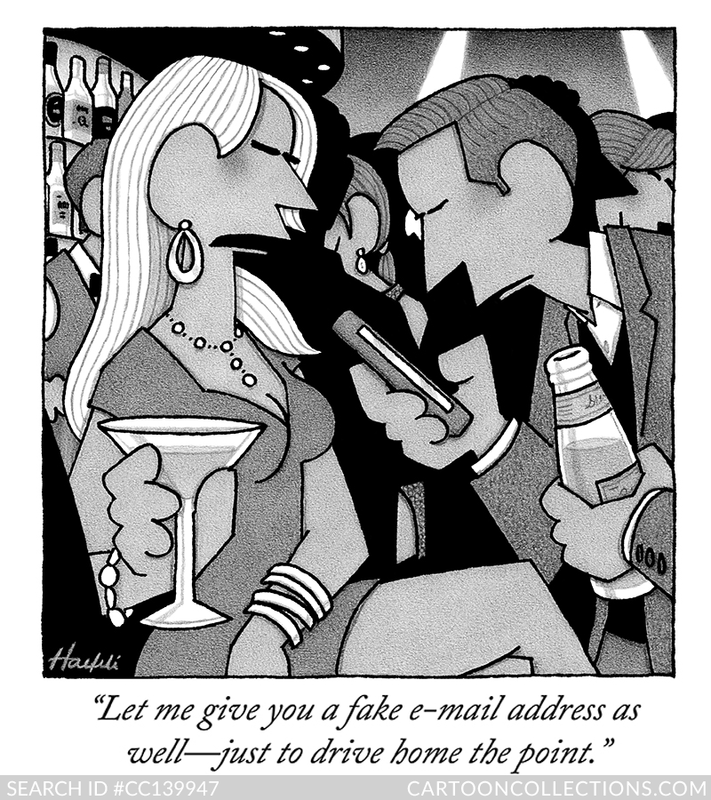 This is a fine example of an anachronism cartoon—plus, of course, the wordplay. Rex: We started off with cartoons about attempted pick-ups. How about some brush-off cartoons? Phil: I like this one by Carolita Johnson. Note how the background is suggested rather than spelled out, but it still conveys a bar. The cowgirl boots create a style difference between the two characters. Rex: Those boots are made for walking—right past old baldy. At least her rejection is tempered by the words “right now”, suggesting that, just maybe, he could try again later. Phil: There’s rejection, and then there’s crushing humiliation, as exemplified in this beautifully rendered cartoon by William Haefeli. It’s a closely cropped composition, but all of the elements are there: a few bottles, a largely obscured bartender, and silhouettes and glimpses of customers. Rex: And the caption is an ego-crusher. Ooh, that’s gotta hurt! Phil: …and this one by P.C. Vey. 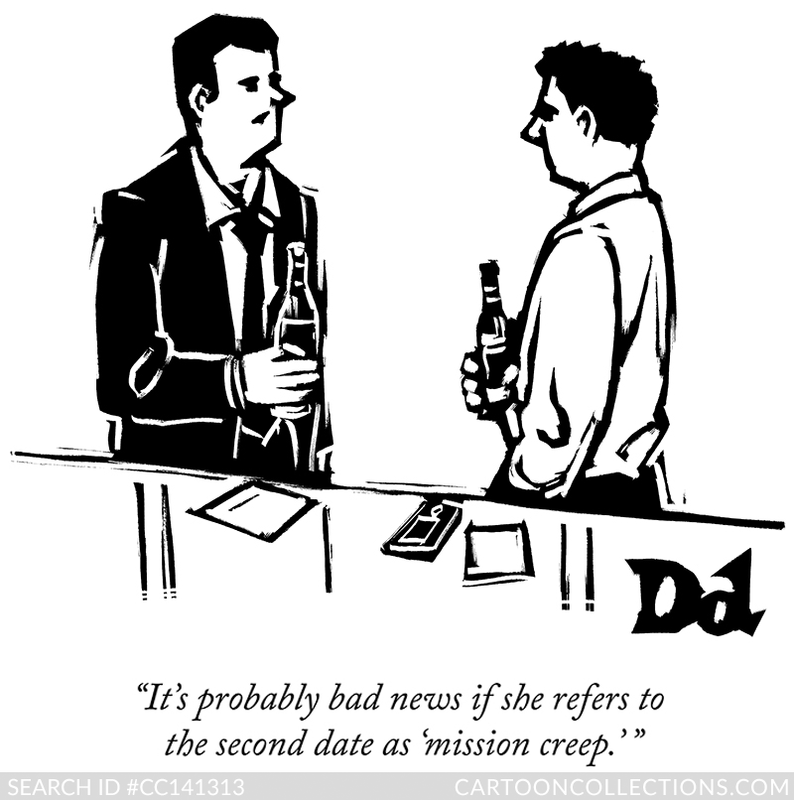 Rex: Bar cartoons often feature bewildered guys attempting to interpret female behavior. Here’s one by Drew Dernavich, sparely but powerfully drawn. 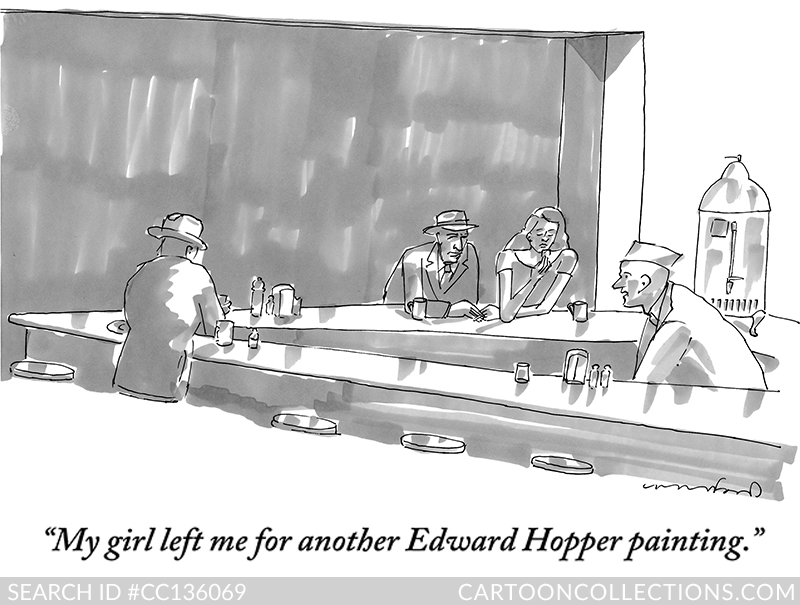 Rex: And saddest of all is this Michael Crawford cartoon, in which a man tells of lost love. Phil: Wait, this is a late-night café, not a bar. Rex: At least the caffeinated conversationalists will have plenty to say. Phil: Let’s end on a happy note with this pleasantly weird cartoon by Joe Dator. 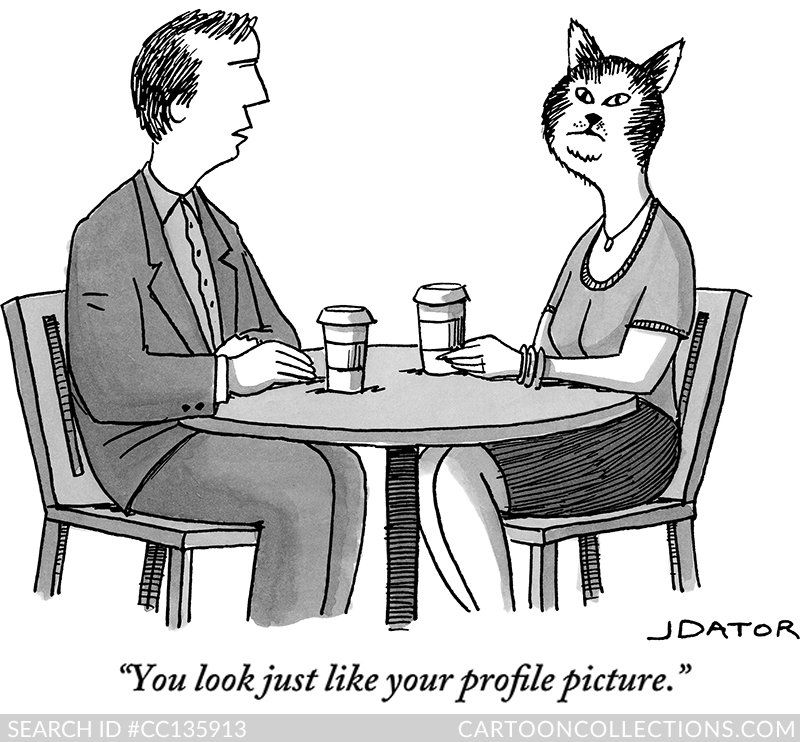 It reflects the current trend to find a compatible partner online, where much depends on the profile photo. Meeting person-to-person or, in this case, person-to-cat-headed woman, comes later. Rex: I think they make a cute couple. I hope it works out.